Kenneth Pillsworth at work in his Vineyard Haven studio. Knocking on doors can get you places. At least it did for Kenneth Pillsworth, who came to the Vineyard during the summer of 1990 because a cute girl from college asked him to. His first week here, Mr. Pillsworth stopped into all of the jewelry shops, knocking on doors and asking if anyone needed an apprentice. Paul D’Olympia and Richard Hamilton both did. Mr. Pillsworth has been making jewelry on the Island ever since. 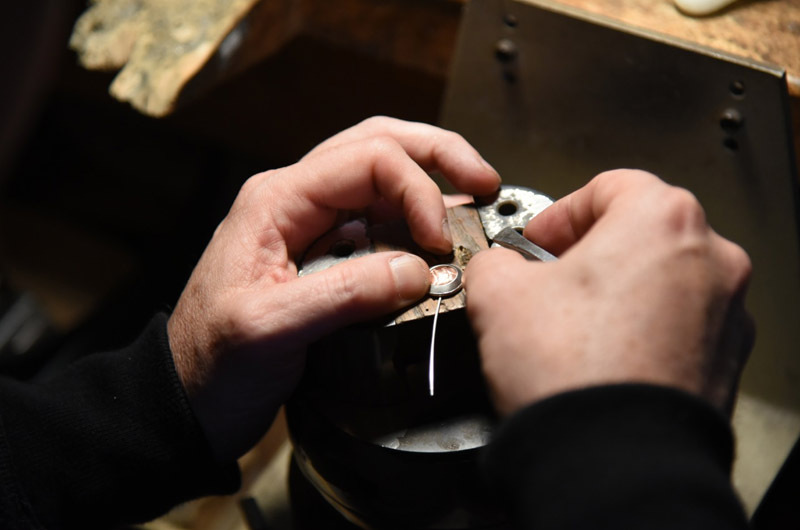 Mr. Pillsworth spent his first summer on the Island rotating between Edgartown and Vineyard Haven, polishing pieces of jewelry for both Mr. D’Olympia and Mr. Hamilton. When the summer ended, he reluctantly returned to New Paltz, N.Y. where he studied painting. But he returned to the Vineyard the next summer, which extended into the fall as he took a semester off from college. Then he took a leap and told his parents he was dropping out of college to move to the Vineyard full time and become a jeweler. It may have helped that his parents knew Mr. Pillsworth was not destined for a future in academia. Growing up in Kingston, N.Y., he didn’t flourish in school and remembers being more focused with the doodles his father, Kenneth Pillsworth Sr., sketched while helping him with his homework than the assignment itself. His father had also orchestrated Mr. Pillsworth’s entrance into the jewelry business. The senior Mr. Pillsworth, a typesetter for a newspaper, was an avid runner and worked out at the local YMCA. There, Mr. Pillsworth Sr. met William Scholl, a master goldsmith. Mr. Scholl mentioned he was in the market for an apprentice and Mr. Pillsworth Sr. suggested young Kenneth, who at the time was a bit direction-less, but talented at drawing and painting. With artistic inclination and no experience, he got the job. If Mr. Scholl started Mr. Pillsworth’s career, the Vineyard launched it. Once he returned to the Island full time, Mr. Pillsworth moved into an apartment above Claudia Jewelry in Edgartown, apprenticing for Mr. Hamilton in the shop below. After the store closed for the evening, he would return to the empty shop, crank his music and work on his own designs. 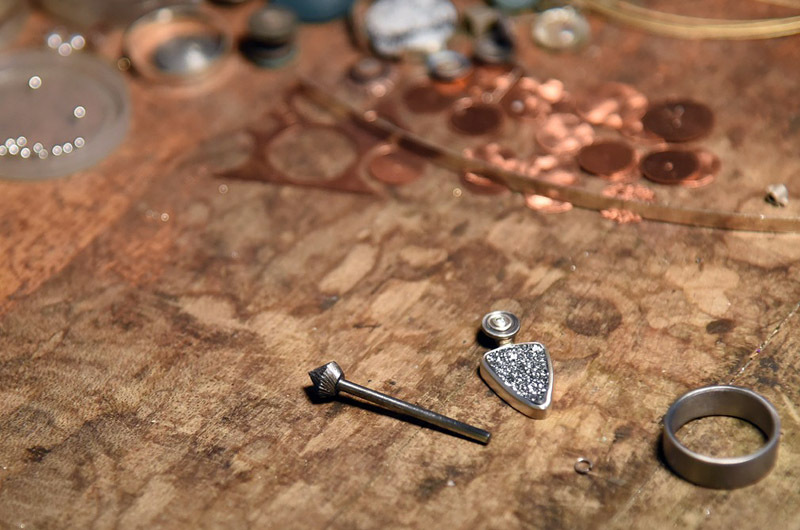 To the tunes of the Cure, the Smiths and Nirvana, Mr. Pillsworth began creating geometric, layered jewelry guided by the interplay of mixed metals. Some of the metals he uses, such as niobium and titanium cannot be soldered, so he included the rivets into the design. “The materials really did form my aesthetic, my look,” he said. His necklaces, bracelets and rings are reminiscent of gears, of saucers, of hubcaps. They are clean, layered and mechanical. Though the spirit of utility courses through each piece, their execution is delicately detailed. Mr. Pillsworth always notices layers in the world. His eyes follow tree branches as they cross in front of each other, and the lines of a building at its cross section. “I’m always seeing, even watching TV and movies, it’s never turned off,” he said. His designs are also driven by the colors of the metal, with certain metals looking better as a top layer than others. To preserve the colors of the metals, he tends to brush finish his pieces instead of high polish. 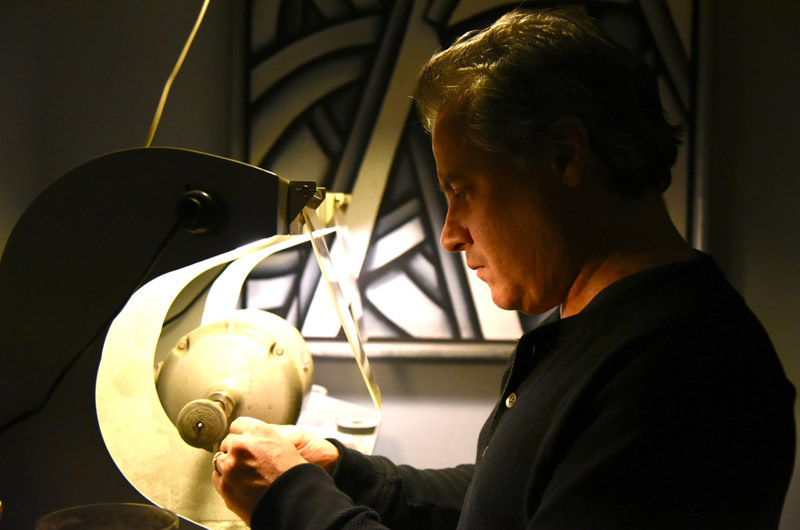 After Mr. Hamilton left Claudia, Mr. Pillsworth joined him as part of the Edgartown Jeweler Studio, a group of artists who shared studio space on Upper Main street in 1995. But it became too distracting to work with so many others, so Mr. Pillsworth moved his studio into his home, something he has had to change many times over the years, doing the Island shuffle. He has lived in every town, from a home in Aquinnah near the lighthouse, to barns and garden sheds so small he had to keep his polishing machine outside. But as he packed his tools and bench up every few months, Mr. Pillsworth was also building an audience on the Vineyard, helped by the Artisans Festival. Mr. Pillsworth had a booth at the first Artisans Festival and has been showing there ever since. The Thanksgiving festival was an annual tradition too, but eventually he stopped to spend the holiday with his family. The Artisans Festival is very close to Mr. Pillsworth’s heart as he found more than professional success there. He also found Jhenn Watts, who showed her photography a few booths over. “She had a boyfriend at the time, but I would bring her snacks or stop for coffee and ply her with food and goodies,” he said. After moving in with Ms. Watts, who favored year-round rentals, Mr. Pillsworth began to settle down. They married in 2006. Now they live in Vineyard Haven, where Mr. Pillsworth works on his jewelry in a studio in their home. He balances assembling his wholesale line with creating custom pieces. On the Island, his line is carried at the Field Gallery. 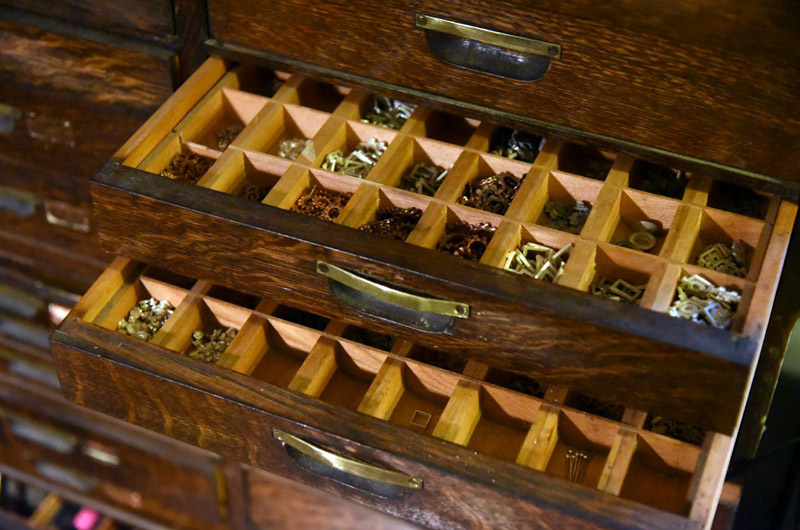 To help out with the workload, including the cutting out of hundreds of small metal circles used in his jewelry, Mr. Pillsworth turns to an apprentice, of sorts. His father, now retired, cuts out circles of metal for him with a disk cutter and sends them to the Vineyard. “That really helps me because when I get an order for something, I have all the pieces ready to be riveted together,” he said. The senior Mr. Pillsworth has been helping for about 15 years now. “He wins employee of the year, every year,” the younger Mr. Pillsworth said. On Friday, Nov. 25, from 3 to 5 p.m. there will be a Small Works show at the Granary Gallery, featuring artists represented by the Field, North Water and Granary Galleries including Kenneth Pillsworth, Ben Johnson, Colin Ruel and Mary Sipp Green. The Thanksgiving Vineyard Artisans Festival takes place on Friday, Nove. 25, and Saturday Nov. 26 at the Agricutural Hall in West Tisbury. Great piece. I love Kenneth's jewelry. And great photos too. In the early 2000's I looked up Richard Hamilton to create a ring for me in Edgartown I wear everyday and get many comments on it. The last few times I've visited the Island i found the store in Edgartown was closed and have no idea where Mr. Hamilton is working today. Great article, thanks.